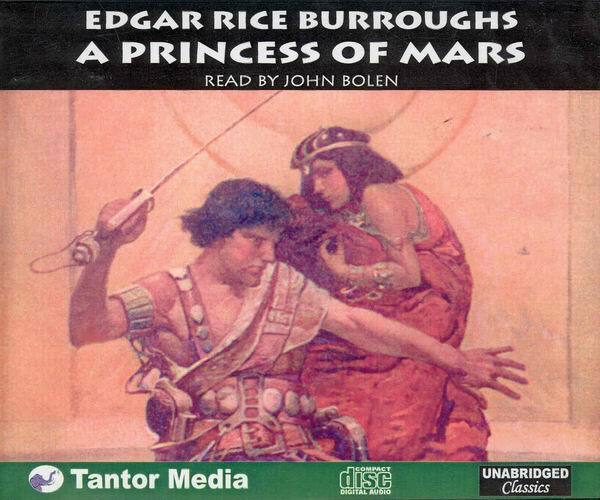 There are few classic novels with as much influence as Edgar Rice Burroughs’ A Princess of Mars. First published in 1912 (serialized in All-Story magazine with the title Under the Moons of Mars), Burroughs sparked the imagination of many of science fiction’s golden age writers, including Ray Bradbury and his Martian Chronicles. The audiobook cover is a detail from the 1919 Grosset & Dunlap cover. A Princess of Mars is an imaginative adventure novel in which John Carter, a Virginian military man who starts the story running from Indians in the Arizona desert, is magically transported to Mars. Burroughs does not go into detail on the mechanics of the transportation, but does go into great detail about the inhabitants of Mars, called “Barsoom” by its natives. 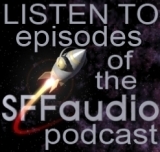 There are two races on Mars – a four-armed green warrior race, and a red human-like race. The princess of the title is Dejah Thoris of Helium, whose beauty captures John Carter when he sees her taken by him in chains by some four-armed Barsoomians. The novel is filled with damsel-in-distress/derring-do-male-hero sensibility that is laughable at times, but still the story holds up as a classic of the genre. Burroughs’ description of an alien culture is a forerunner of an entire category of science fiction, and I found it entertaining on that level. I also felt a great deal of nostalgia, because I read this book a few times as a early teen, along with the other ten Mars volumes, and a Tarzan or three. John Bolen performs the whole book as John Carter, with a southern gentlemanly manner that the character demands. This means not only Carter’s attitude, but his southern accent, which took me a few minutes to settle into. 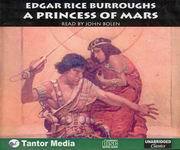 Check out Tantor’s science fiction and fantasy section for more Edgar Rice Burroughs titles. There are far more than 2 races on Mars! While the first novel is chiefly concerned with the Red and Green races, we learn of the Yellow, Black, White (of several different varieties) and other races which sprang from the original Tree of Life.